Joy and I had reserved a week at our rental property. Mom and Dad called a couple of days before we left and surprised us with their being able to join us for the week. As if that wasn’t sweet enough, my niece and her fiance were able to join us for the last couple of days of the week. We ate out a few nights. One night we ate at The Flying Fish down by the Oak Island Pier. It was cool enough to sit out on the deck in the open air by the beach volleyball court. Dad and I came back to the Flying Fish to meet the guys for beer on Wednesday afternoon. My friends passed the “my Dad likes them” test – just like I knew they would. Shagger’s was our second meal and I think it was everyone’s favorite. Get the fries cone with Old Bay seasoning. The third meal outing was to go to the Provision Company in nearby Southport. We ate looking out over the boat slips to the Atlantic Intracoastal Waterway. We enjoyed all the restaurants, but there are several more I want to share with my parents. But our best meal time was just chillin’ on the back deck with our breakfast, watching the waves roll in. Hanging with Mom, Dad, and Joy and an ocean breeze is just about as relaxing. Joy did a morning constitutional every day. Usually, she walked east to the Ocean Crest pier. But one morning she decided to head west. Good thing, too. 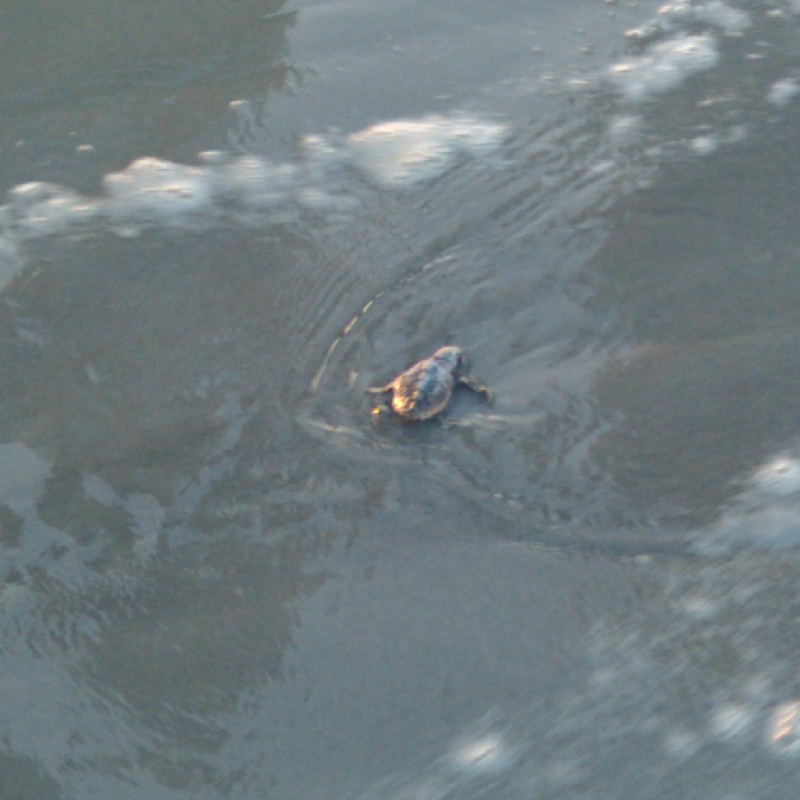 She happened to see the very last of 75 turtle babies make its crawl to the sea. And she got some great shots with her cell phone. 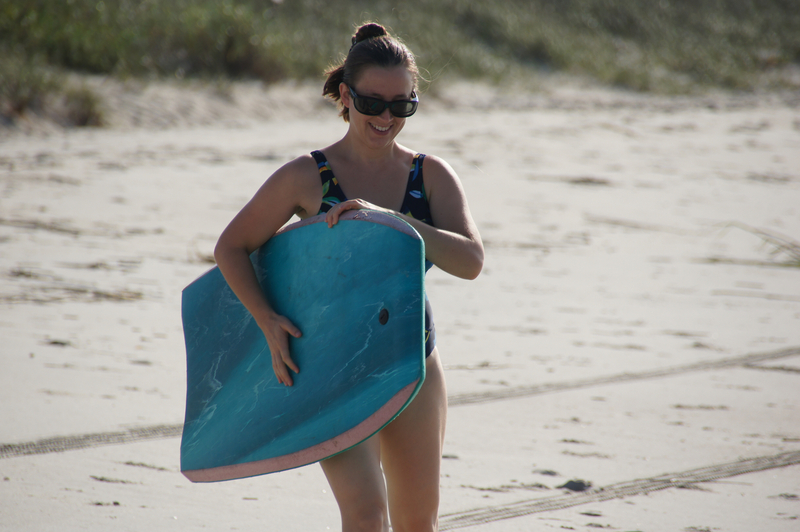 While Joy was walking, I was “surfing”. (If you’ve ever seen me surf, you’ll understand the quotation marks.) I caught at least one wave every day. I had so much fun I decided it was time to take her in for ding repairs. Now my made-in-Hawaii board will be re-made by an Oak Island shaper and carry two of my favorite places out to the sea with me every time I paddle out. 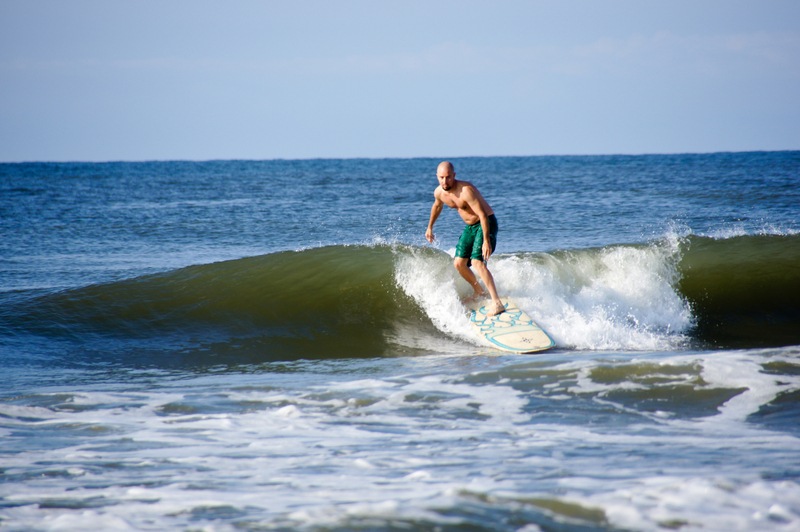 But when Jack used my board it did things I never imagined that it could do. That man really surfs. He and Ruth even caught some waves together, when she took a break from boogie boarding. All told, I think everyone had a great time. Hard not to have a great time when, every time you stand up, you see the waves rolling in to the shore.